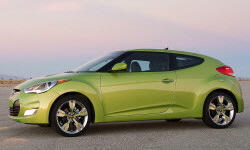 2013 Hyundai Veloster Pros and Cons: Why (Not) This Car? You might have noticed that Hyundais are more eye-catching than they used to be. And none catches eyes more avidly than the Veloster introduced last year. But reviews were mixed because the Veloster's name suggested speed, and the car appears quick, but, with a 138-horsepower engine, it's not quick. For 2013 Hyundai has addressed this deficiency by adding a turbo to the 1.6. Some details lifted from Porsche + Audi, but too much gray. Why no red option, as in the non-turbo? 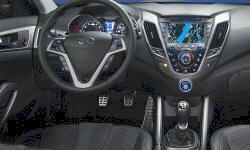 Why the 2013 Hyundai Veloster? Especially without the turbocharged engine, and even with it, the Veloster's #1 strength remains its exterior styling. Even after a year on the road the racy futuristic egg still appears more concept than production. Especially when painted lime green. On top of this, you're getting two exteriors in one, as the passenger side of the car has two doors while the driver side has one. The Veloster's interior isn't quite as stylish, but compares well to anything else about the same price. Hyundais aren't nearly as cheap as they used to be, but they're still less expensive than non-Korean competitors. The Veloster Turbo lists for $22,725. While this figure is $4,500 more than a base Veloster, it includes 18-inch wheels, a 450-watt audio system, and heated leather seats in addition to the turbocharged engine. Adjust for these, and the engine is adding about $2,000. Still seem a little steep? Well, the other available three-door turbocharged hatchback, the MINI Cooper S Clubman, lists for $9,175 more. Adjusting for feature differences using TrueDelta's car price comparison tool only narrows the gap by about $600. A Honda Civic Si lists for only $450 more, but adjusting for feature differences (no standard sunroof in the Hyundai, no available leather in the Honda) widens the Veloster Turbo's price advantage to a more substantial $1,750. Even more exotic from this angle, AND with Lambo-class rearward visibility. Similar to other Hyundais, but more congruent with the exterior in this case. Like many other Hyundais, the Veloster Turbo feels about ten percent less powerful than it actually is. But 90 percent of 201 horsepower in a 2,800-pound car still feels perky enough to (finally) justify the car's name. On the other hand, the manual transmission's shift feel barely earns a passing grade. Those in Hondas and Mazdas feel slicker, shorter of throw, and more precise. Fuel economy used to be the #2 reason to buy a Veloster. But Hyundai had to revise its EPA mpg figures due to flawed testing procedures. The revised figures--24 mpg city, 35 highway with the manual and 24/31 with the automatic--are much less impressive, but still competitive. Okay, adults won't want to spend a long road trip in the back seat of a Veloster. But given the car's sleek styling and tidy exterior dimensions, there's a surprising amount of room back there. Not only is the third door justified, but a fourth portal would also be welcome. As is, whoever sits in the left rear seat has no easy way to get to it. Between the lack of a fourth door and the presence of a low console where a fifth person might otherwise sit, it's as if they want people who regularly tote kids to get an Elantra GT. Which, sadly, isn't offered with a 201-horsepower engine. 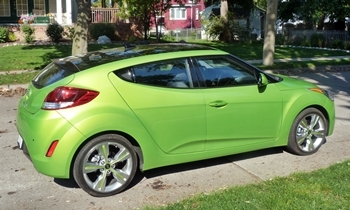 Why Not the 2013 Hyundai Veloster? Despite the sleek, futuristic exterior, the Veloster's windshield is more upright than many these days. The view forward from the driver seat is pretty open. But the view to the rear quarters--there isn't any. If two roads merge at an angle well under 90 degrees, you'll want someone in the passenger seat to inform you whether any cars are approaching from your blind side. While the Veloster's rearward visibility would cause the most aggravation in daily life, people aren't necessarily buying this car for practical reasons (though, between the usable rear seat and cargo area, it's pretty practical). They're buying a Veloster, especially the Turbo, to have fun. While the Veloster Turbo doesn't handle badly, it doesn't feel nearly as agile nor as engaging as a car this compact, light, and powerful ought to. Its steering, though modified from that in the regular Veloster, still isn't notably quick or communicative. Its chassis, though stable, doesn't feel eager to turn. No door on the left, a center console to hop, and high window openings...but better than expected! That's all I have for why not to buy a Veloster. A short list, yet possibly still a fatal one for anyone who prioritizes rearward visibility or driving enjoyment. Hyundai has fixed the engine for 2013, and they could well fix the handling for 2014 or 2015. They're very good about responding to constructive criticism. But the poor rearward visibility? It's inherent in the car's design. Small cameras are covering more and more angles in cars lately. One might do the trick here. One Veloster shortcoming rectified, two to go. Hatchback versatility. Rear seat folds. Preview drive. Hyundai provided lunch and access to fueled and insured cars at a media event. 2013 Hyundai Veloster pros and cons, according to Michael Karesh: the best reasons for buying (or not buying) the 2013 Hyundai Veloster. Join TrueDelta to post your own impressions.